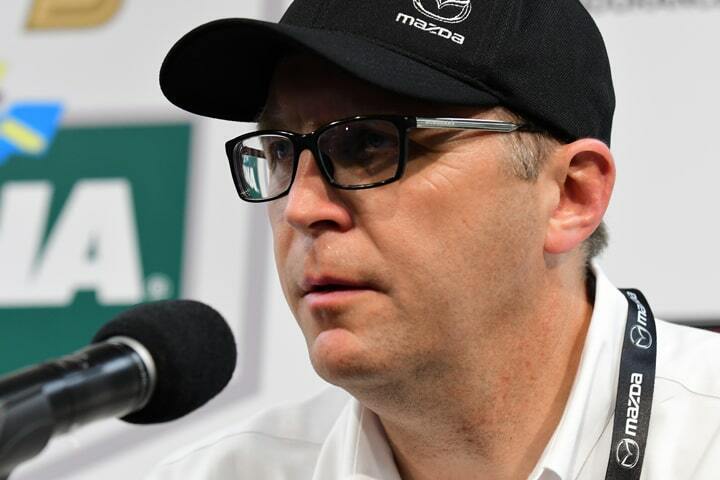 RacingJunk News > Racing > Other Racing > Sports Car Racing > Will Mazda Stick with IMSA? Since the advent of IMSA’s DPi category in its WeatherTech Sports Car Championship, the vast number of victories have gone to Cadillac and its engine-building concern, ECR Engines in Welcome, North Carolina. This year was no different at the 57th Rolex 24 at Daytona, where a monstrous battle for the victory – and those Rolex Daytona watches gifted to the victors – was waged between Wayne Taylor Racing, Action Express and Acura Team Penske. Not one of these teams won pole position for the midwinter twice-around-the-clock class. No, it was Mazda Team Joest’s Oliver Jarvis and Mazda/engine builder AER who gained pole position in the No. 77 Mazda RT24-P, erasing PJ Jones’ 26-year record on the 12-turn, 23.56-mile road and oval circuit at Daytona International Speedway. Jones’ record, set in a Dan Gurney’s All American Racers Toyota Eagle Mk III GTP prototype, came well before Balance of Performance (BOP) edicts balanced power levels to equalize performance between all entries in the prototype classes, which this year are comprised of DPi and Le Mans entries in LMP2. Mazda, of course, was the only Japanese manufacturer to win the 24 Hours of Le Mans in 1991 before Toyota’s first win in 2018. That large accomplishment simply hasn’t carried over to Mazda’s American sports car activities. Sure, the company has earned 22 class victories at the Rolex 24, a streak that began 40 years ago with a 1-2 finish for the Mazda RX-7 in the GTU class. 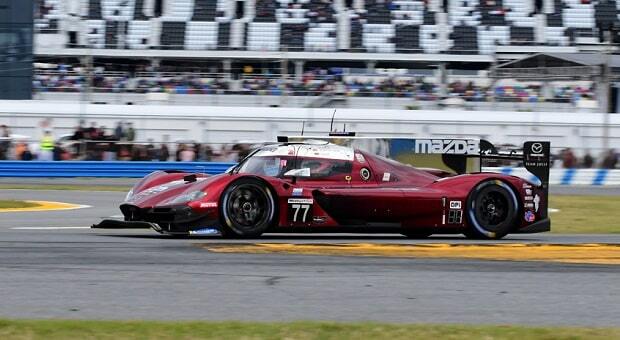 But Mazda was loaded this year with a stellar driving team, one of the best-organized squads in modern racing history in Joest, optimal pit position earned during its excellent test at the Roar in early January and accompanying momentum. Everyone always talks about momentum. This race, however, doesn’t always go to the quickest and fastest car in the field. It doesn’t always go to the most powerful squads aligned with an excellent chassis and engine manufacturer. Mazda is star-crossed. Its pole position-earning No. 77 team was out of the race before the halfway point; the No. 55 lasted through the rainy daybreak but had to withdraw from competition. Both of these cars suffered mechanical maladies: the No. 77 had an exhaust valve issue that imploded the turbocharger, causing a massive fireball. The No. 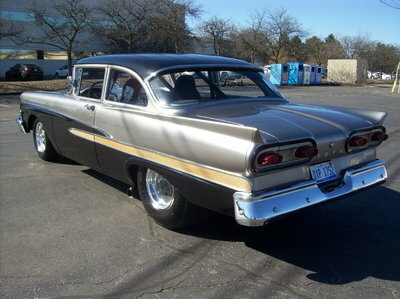 55 first lost time with a fuel leak and then succumbed to an oil leak. Attempts were made to R&R the engine so that team could continue. 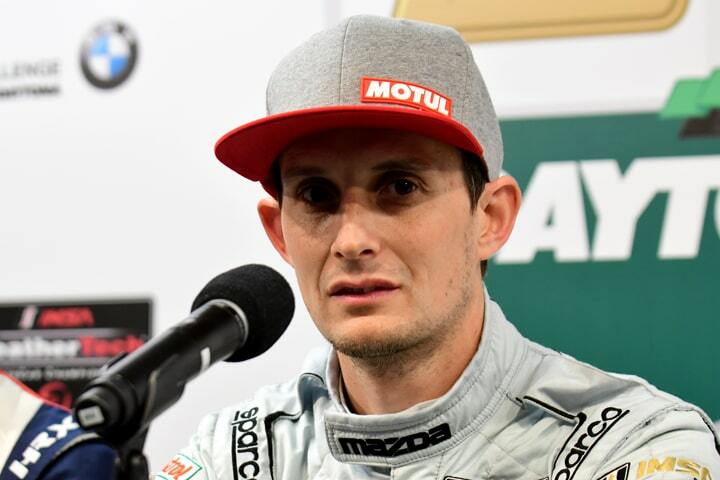 With the time remaining, those attempts would have been futile at best, so the team elected to call it a race and pack up, hoping they can find a better solution before arriving at the track that’s truly too tough to tame – Sebring International Raceway – in mid-March. Under the care of John Doonan, Mazda Motorsports thrived for a long time, with its Road to Indy program for aspiring open-wheel racers and its Road to Daytona for sports car aficionados. The former program is no longer in existence; the latter only barely survives. Mazda no longer lends its name to Laguna Seca, the Northern California road course infamous for “The Pass” and beloved for its historic races each August. As Mazda began to pull back from many of its racing endeavors – even as its MX-5 Miata continues to be the most raced vehicle in the USA – one of the casualties was SpeedSource, Sylvain Tremblay’s racing team in Florida, which had great success building and campaigning Mazda cars, in particular the RX-7 and RX-8 rotary-powered cars for which Mazda was initially known. When Doonan and his corporate allies decided to go with Team Joest, responsible for the hybrid Audi’s great Le Mans successes over the years, Tremblay was forced to cut bait and sell his shop after a 20-year run. This after the team had experimented, going from the loudest car in the paddock, the RX-8 rotary, to the quietest, a Mazda diesel-powered prototype built by SpeedSource. The lack of success with the latter race car caused Mazda to look elsewhere; when Joest’s services became available SpeedSource and Tremblay were out. AER, the current engine builder, has past history with Mazda, having built and campaigned the P32IT twin-turbo V8 engine Dyson Racing campaigned with success. The MZR-R was the first Mazda engine, developed for use in LMP2 and also campaigned by Dyson Racing, whose owner Rob Dyson eventually purchased AER and elevated its engine program to include the current Indy Lights power plant. The current Mazda engine, the AER P91 P as campaigned at Daytona this year is a 2-liter inline four-cylinder turbo, a direct descendant of the P41 that AER has used to success in LMP2 competition. Last year it was conservatively boosted; the finishing positions were close to what was recorded this year: the No. 77 finished 46th and the No. 55 was 42nd of the 47 entries. Mazda, as a small vehicle manufacturer, hasn’t had the best results of late; its most recent sales period saw a reduction of nearly 20% from the year before. Even the mighty MX-5 Miata fell more than 20%. From the Le Mans success of the Mazda 787B to now, a heck of a lot of money has been spent to promote the brand, which produces great cars that just aren’t known to a sufficient number of people.